The following article first appeared in "The Low Down to Hull and Back News" in the November 03, 2010 issue. Reprinted with permission. This poem was written in 1928. Two years earlier Jason Cross's homestead had been expropriated for a major hydroelectric project on the Gatineau River. The Mr. Strumbert named in the poem was the Gatineau Power Company land agent. This poem exemplifies some of the frustration and bitterness experienced by those who lost treasured farmland, homes or cottages along the Gatineau River in that period. There is some uncertainty among current day Cross descendants about who wrote this poem. Although written in the first person of Jason Cross, the author may have been his brother, Walter Cross, a well-known writer of verse. That has gathered up some moss. 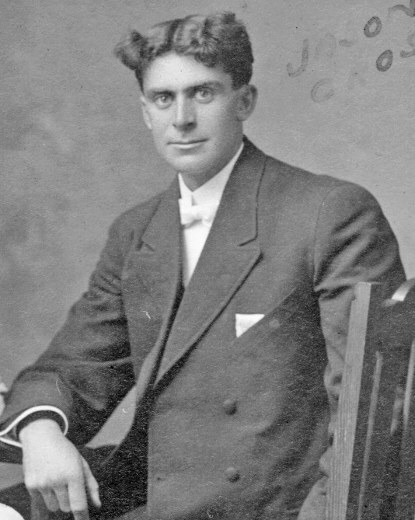 Jason Cross in his mid-twenties (circa 1910). 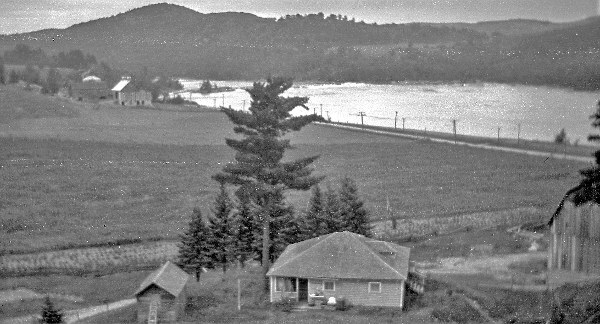 Photo courtesy Gatineau Valley Historical Society. Because it was a fine location. No more I'm going to roam. And call the place my home. And built a silo for my corn. And built one neat and plum. And my little Ford Sedan. And their legs have all got bent. Cascades prior to the flooding of the Gatineau River, looking across Bates field. The building in the foreground was part of the Jason Cross farm (circa 1923). Photo courtesy Gatineau Valley Historical Society. And burned them all night long. And know just where to lay. I put a toilet in the house. To bed the hired men. And made it nice and neat. And watch the passing train. Who put me a mess. He said, "We're going to build a dam"
Will drive you from the shore." I've spent money here galore." Will at once to you be sent." That they wanted so much land. That I had never heard before. That were entirely new to me. What land they were going to take. What they would take from me. Would cut my farm in two. With a head both big and flat. In spite of he or me. And tramp out all my wheat. And all that I possessed. Was always nice and clean. On that old Gatineau Street. We own the river bed." "You are bounded by the shore." If you going to deal with me. You'll have to let it stay. And give you a dollar bill. That I would have to spend. For I couldn't get no more. And put windows in the barn. To shingle up the roof. And steered it for the gate. To keep the ball in bounds. So it was let to Lu and me. The court grew up with hay. By the name of Eaton's Chute. "Why this should be Kirk's Ferry"
So isn't that the proper name? I don't know where in hell I am.